Elaborate cabinets such as this one were created to store valuable objects. This cabinet, with its numerous secret compartments and mirror concealed inside the hinged lid, was likely made to hold jewelry. 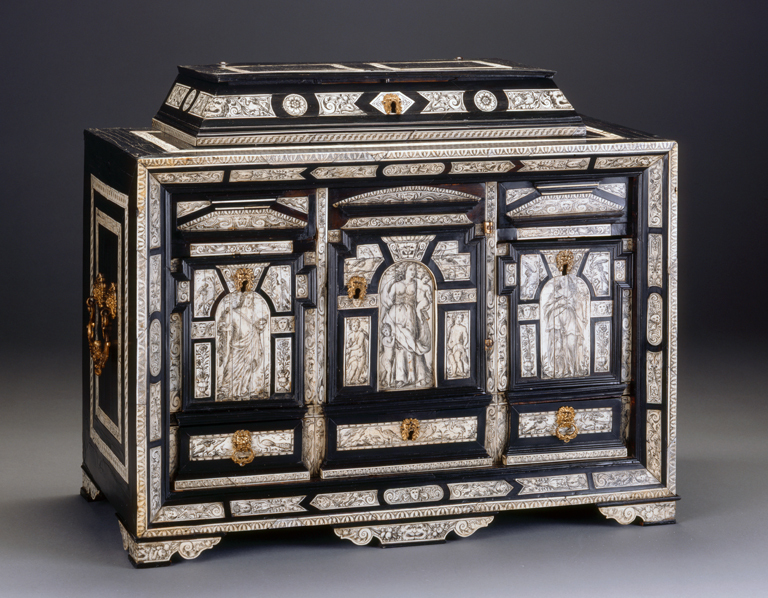 The cabinet is inlaid with ivory and features the three theological virtues—faith, charity, and hope (pictured from left to right)—suggesting that concern with worldly goods like jewelry must be balanced by strong faith, a tension that is explored in many artworks of this period. Winters, Laurie et al., A Renaissance Treasury: The Flagg Collection of European Decorative Arts and Sculpture. New York: Hudson Hills Press, 1999, p. 98, cat. 42, color illus. p. 99.